If you’ve had a baby or gone to any baby showers in the last five years, you might be familiar with the ‘Sleep Sheep’ – the ubiquitous cuddly sleep aid for babies. Manufactured by Cloud B, the Sleep Sheep is a plush sheep toy that plays relaxing sounds to help little ones fall asleep. Now Cloud B has just introduced a brand new eco-friendly sleepy pal called the Dozy Dolphin! Since I’ve got a little one who sometimes needs help falling asleep, I couldn’t wait to check out this eco dolphin. 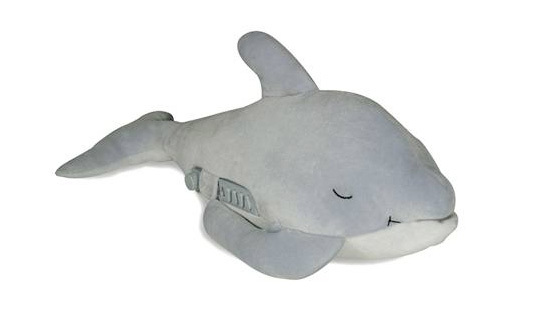 Made with eco-friendly materials (ultra soft bamboo fabric and hypo-allergenic stuffing), the Dozy Dolphin is designed as an interactive plush toy that also helps soothe children to sleep. It features four relaxing water based sounds: PLAY (cute sounds of dolphins playing), CALM (whale noises? ), RELAX (tranquil music) and SLEEP (ocean waves). The first time I heard the Dozy Dolphin in action, I had to laugh, because not all of the noises it makes are exactly ‘sleep-inducing.’ The ‘PLAY’ sounds (dolphins chattering) are actually quite funny, and they make my little tot laugh. However, now that my little guy has warmed up to the chattering dolphin, I think it is great. I haven’t actually used it much to get said baby to go to sleep at night, but he likes playing with it during the day. I imagine this little dolphin is going to get used for years to come, and I feel reassured knowing it’s made out of safe, biter-friendly, hypo-allergenic materials. Hi1 First I really love your site and have enjoyed reading for a long time now so I don\'t mean to be rude or critical but I\'m not sure how this Dolphin is really eco-friendly. The bamboo exterior is really nice for sure, and maybe even sustainably sourced (not all is) and no doubt soft, but there is nothing eco-friendly about the plastic box of an audio player (which they do not claim is from recycled content) and the need for batteries. Not to mention the fact that any electronic audio device carries harmful heavy metals in it\'s components and is likely to emit some for of off gas as it warms with use. not something I would like my kids to cuddle with at night, sorry. If you've had a baby or gone to any baby showers in the last five years, you might be familiar with the 'Sleep Sheep' - the ubiquitous cuddly sleep aid for babies. Manufactured by Cloud B, the Sleep Sheep is a plush sheep toy that plays relaxing sounds to help little ones fall asleep. Now Cloud B has just introduced a brand new eco-friendly sleepy pal called the Dozy Dolphin! Since I've got a little one who sometimes needs help falling asleep, I couldn't wait to check out this eco dolphin.